I have an 11 speed Athena chainset, and I've stripped one of the chainring bolts. 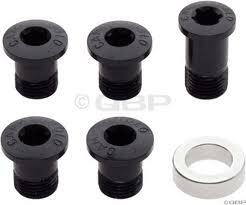 It's £40 for a replacement Campag set! Can I just buy Race Face at £4.70 and expect them to fit? No, you will need a set that is Campag compatible. Some Campagnolo cranksets use special chain ring bolt that bolt through the ring and into the crank, at least behind the arm. The Athena 11 speed appears to be one of these. One of the 5 bolts is longer than the rest. And unlike other brands, these bolt into cranks, not into a receiving nut. This is a picture of a compatible set. It may also depend on the material and year of manufacture. The Campagnolo spare parts list uses different codes for the carbon and alloy replacements. For the carbon crankset, there seems to be a different code for the power torque (2011+) and ultra-torque (2010) versions too. I recently bought a set of FC-AT300 bolts for my Centaur Carbon chainset, this part is listed in the 2012 catalogue as being suitable for Athena Carbon 11-speed and all other 10-speed cranksets (with black bolts). Not the answer you're looking for? Browse other questions tagged parts chainring or ask your own question. Do I need to change my cassette if I can't see any wear?